world." He said this instead. Last Sunday I did my annual moon ceremony and set intentions for the coming year. But ever since then, there has been a phrase interrupting my thoughts. In fact, I think this phrase could be considered a "master resolution", one we could all choose for the coming year and one that, if everyone chose it, could really change the world. So I thought I'd share it with you. But first, a little about New Year's resolutions and ceremonies and whatnot. I'm pretty well known in a very small circle of people for doing THE BEST year-end ceremonies. I used to do them just for myself, but about 15 years ago, I started opening them up to others, either for a fee or just for fun. I'm kind of strict about having people focus on just one thing they want for the coming year. While I think you can achieve more than one thing in a year, I think something needs to become a central focus and mnemonic aid. With more than one thing, you're juggling your focus and may not even remember what you wanted by year's end. So last year my one thing was "motivation" and I wrote it on seed paper and planted the seed paper. Then as I watched the wildflowers grow from it (and they are, oddly, still alive on my back porch) it would be a reminder to keep motivated. Having this one thought in my mind helped me change my behaviors and I did have more motivation this past year. Despite my motivation, 2014 was kind of crappy for me (and I've heard many others say the same.) It began by being betrayed and bullied in a business deal by a colleague I truly thought I could trust. I didn't write about it here, but it was toxic enough that I consulted a lawyer...something I've never done before and hoped I'd never have to do. The big thing, though, was that the general exhaustion and lack of energy I'd been feeling for a couple of years got significantly worse. I chose the word "motivation" to try to keep me moving through what was a really difficult phase for me physically and emotionally. It was so bad that sometimes I couldn't even put dog food in the dogs' bowls without getting out of breath and exhausted. I'm overweight, but this was way beyond that. Some days I was just generally exhausted and other days I was completely unable to function. The good news is that I've recently turned a corner on all that, so "healing" is my word for the coming year...healing physically, emotionally, spiritually, etc. I created a "mojo bag" to carry with me and remind me of my goal. I put some jingle bells in the bag and have already jingled it many times to remind me of my focus, kind of like snapping a rubber band on your wrist to break a habit. But ever since I decided on that word, I've been hearing something else in my head—"hold yourself to a higher standard." As I've thought about this phrase over the past week, I see how brilliant it is. To a certain degree, I think all of us who do our yearly wishes or resolutions hope for some sort of outside influence to help us. So when I say "healing", I'm certainly thinking that I need to do and seek out healing things. But I'm also hoping that healing things will find me. And they will. But I can't hang my entire year's single resolution on the hope healing will wash over me. Nor could I if I'd wished for love or luck or joy or growth or anything else. "Hold yourself to a higher standard" reminds me to put the responsibility for healing squarely on my own shoulders. And it says that when it comes time to make choices—stick with a new doctor or keep looking, indulge depressing thoughts or encourage motivational thoughts, eat ice cream or a handful of almonds—that you hold yourself to a higher standard, whatever that means to you and your goal. It says that, this year, you're going to make choices that support not only your goal, but that also support your growth as a human being. You'd think this would be a no-brainer, but it's not. Think back on your behaviors over the past year. How many times did you choose (and stick to) a higher standard vs. how many times did you choose to do what you've always done? Choosing a higher standard means doing something differently than you've ever done it before. It means looking for the next level of growth and making choices in alignment with that. It means stepping out of your comfort zone and even doing things that are "out of character" for you, but in a good way. Holding myself to a higher standard would have probably kept me from entering into the bad business partnership in the first place. (In retrospect, I admit I had clues, not so much to how sleazy these people were, but to how badly the arrangement would have worked out.) It also would have definitely had me changing doctors sooner, because my doctor didn't even try to look for the causes of my health issues. And I can see how I would have been even more motivated had I simply "held myself to a higher standard" last year. In other scenarios, holding yourself to a higher standard might include not dating the same "type" as you always do, learning new ways to redirect your thoughts from negative to positive, eliminating fried foods from your diet, focusing on what already makes you feel loved or happy, rather than hoping for other love or happiness to find you...whatever your resolution is. The bad news about holding yourself to higher standards is that it changes you...sometimes in ways that mean relationships change. Sometimes it can leave you feeling alone, because while you know you did the right thing for yourself, the right thing sometimes means going against popular opinion. But the good news is that it frees you from things you feel bad about and it helps you achieve new levels of personal growth. And also, new people eventually appear in your life that operate on that higher level. What I know from my own experience, doing the right thing is not always popular. This is why we get stuck in certain cycles. Let's just take gossiping as an example. If you feel bad about gossiping, but all your friends enjoy it, you have to participate to keep those friendships alive. If you say you don't want to talk that way about people, your friends will either feel judged or they'll form a pact with you to stop. If they feel judged, they might not invite you along as often. They might start gossiping about you. So often we get stuck in certain cycles in order to maintain the status quo. We get comfortable there. And staying seems better than the consequences of losing the companionship of friends you've had for a long time. So you end up stuck at a certain stage of development, rather than face any unpleasant consequences. The only way we grow and stretch and change as human beings is by holding ourselves to higher standards. And it can be so comfortable to just say "I'm a good person as I am, I'm in a good place" and leave it at that. But even Oprah has ways in which she doesn't hold herself to a higher standard. And I'll bet you know exactly what you need to work on in your own life. I'll bet you know exactly where you're letting your higher self down. Holding yourself to a higher standard is a practice that says you believe you deserve better for yourself and can give the people around you more of the "you" you came here to be. Frankly, I think everyone could use to hold themselves to higher standards. When I look around my Facebook feed, I see people who are good at heart do and say things that they don't even see are against the things they believe in...hateful words from "light workers", hypocritical opinions from people who want a better world, etc. We are all guilty of that stuff. And none of us want to believe we're hypocrites. But we all are in some way. If you look, you'll see where the things you say and do don't align with the person you believe yourself to be. And that's where you can hold yourself to a higher standard. As I said before, this is kind of a universal resolution that we all can—and should—take on in 2015. If you don't believe that's what we came here for, first, I can't believe you've read down this far...haha. And second, stop reading. The rest of us feel we came here to grow and become the best we can be. Some of us might have given up on that...maybe we're happy enough with where we are or maybe it just became too taxing doing it all the time. Some of us might have just forgotten or become distracted. And some of us didn't forget, but have just neglected it. That's all fine. We all do all of that. But now it's time to remember. Because we can sit around hoping the world can change, or we can change the world around us. 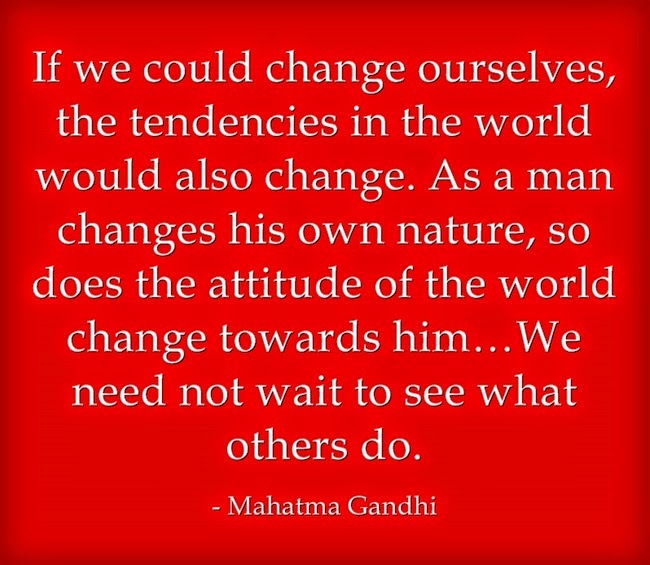 Changing the world around us doesn't require anything from anyone but ourselves. Part of it comes from changing the way we perceive things and part of it comes from changing what we put out there so what is reflected back at us is more aligned with our goals. So let's make 2015 the year we go beyond resolutions to actively change the world around us into the world we want to live in. Who's with me?